After a big week of promotions to report the last time I did this, the last seven days were more about the weird (lots of player movement for procedural purposes) and the unusual (a player going on military leave) than well-earned promotions – though there were a couple. *The moves covered in this edition of Transaction Tuesday cover July 18 to July 24. A number in parenthesis represents the player’s ranking in the midseason WOW Top 50. We’ve already given the full-court press on yesterday’s trade. Stephen gave a general recap of the deal and what it means for the Braves while I focused on the prospect acquired in the deal, Huascar Ynoa, with a scouting report. Activated: Arodys Vizcaino…A right index finger strain didn’t keep Vizcaino out of action for long. It’s been a weird season for the hard-throwing righthander. A year after turning into a groundball pitcher, he’s reverted back to his 2015-self with a groundball rate just south of 40%. He’s also allowed five home-runs – nearly half of his career total. That’s played a big part in an FIP of 3.89. And no, this isn’t a SunTrust Park thing – only one of those homers occurred in Georgia. He got off to a slow start but was dominant from April 27 to July 1. His numbers started to fall again before his trip to the DL. 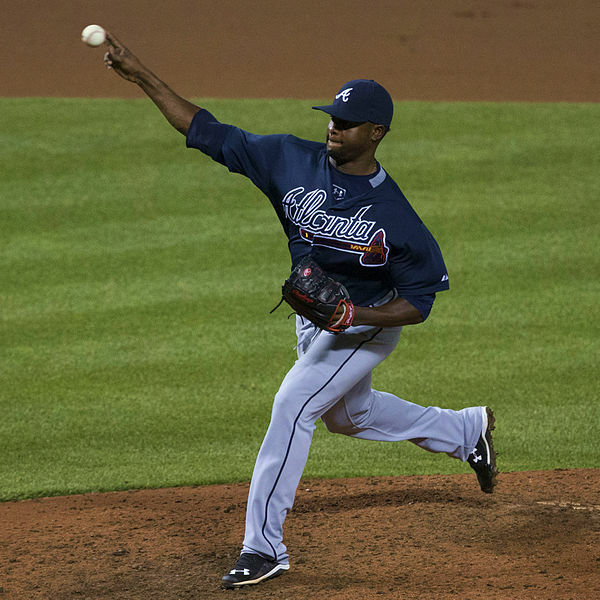 The Braves are hoping he gets going again as it both helps his trade value and gives Brian Snitker more options should the Braves trade Jim Johnson or at least demote him from his current position. Placed on Bereavement List and Activated: Kurt Suzuki…A day after hitting a big two-run homer in Atlanta’s 6-3 win over the Dodgers last Thursday, Suzuki headed to Hawaii for his grandfather’s funeral. He was activated Monday. It’s been a great season for Suzuki, who recently reached 1 fWAR for just the second time in the last six years. He could garner some trade attention moving forward, but with Anthony Recker dealt yesterday, Atlanta will likely hold onto their backup catcher short of an offer John Coppolella can’t say no to. Promoted: Matt Wisler…Like his other call-ups this year, Wisler’s return to the majors will be short. Aaron Blair has been given Jaime Garcia‘s spot in the rotation. Instead, Wisler is back in the bigs to help out the bullpen. He got that shot in Monday’s game and got hammered. At this point, we know what Wisler the Starter looks like and it’s not good. We also have seen glimpses into what Wisler the Long Reliever looks like and that’s not too attractive of an option either. What about Wisler the One-Inning Reliever? It seems like that’s the only stone left unturned here. Consider this: Wisler has mid-90’s heat and can touch 97 mph on the gun as a starter. He might be able to consistently hit 97 as a reliever or at least be able to push his velocity that high more often. We also know that throughout his career, he has a slider that is capable of generating whiffs. In fact, it’s the only pitch he’s been able to get swings-and-misses on. Now, if you were able to take his control, increased velocity, and plus-slider and turn it into a reliever, you might have the makings of a solid option out of the bullpen. At any rate, it’s time to try something new with Wisler. Released: Eric O’Flaherty…Atlanta kept hoping they could get something out of the former star reliever, but ultimately, O’Flaherty just couldn’t find his groove anymore. Since returning to Atlanta last year, O’Flaherty had a 4.91 FIP over 47 innings while allowing seven home-runs. During his best three years in Atlanta during his first run as a Brave (2010-12), O’Flaherty gave up seven homers in 175 innings with a 2.98 FIP. O’Flaherty had been on the DL with left rotator cuff tendinitis and there was no word on any time table ahead of him being released. Atlanta could have opted to send him to the 60-day DL to get a roster spot, but instead, ran out the clock on something else. O’Flaherty reached ten years of major league service by the Braves waiting as long as they did to release him. That ensures a full pension from Major League Baseball. A solid move by the Braves as they reward one of their most well-liked pitchers of the last decade. Activated and Promoted from Mississippi: Joseph Odom…After spending most of the first three months of the season on the DL, Odom appeared in four games with Mississippi before landing back on the DL. Once activated, he was promoted to replace Recker. 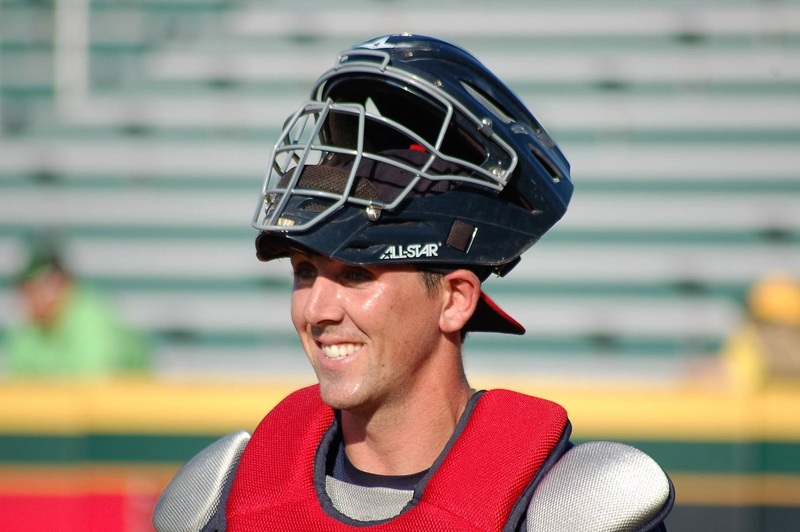 His first few games in Gwinnett haven’t been great, but Odom will likely be the guy moving forward for the G-Braves behind the plate as the only other catcher on the roster, David Freitas, is a 28-year-old journeyman hitting .265/.346/.354. Odom has been lost in this new era of a number of interesting catching prospects in the Braves’ system, but he did rake last year with Carolina, hitting .292/.349/.500 with 8 HR before a promotion to Mississippi. To be sure, he struggled after arriving in Double-A. Odom is solid backstop behind the plate, though not elite. At the plate, he’s progressed each year in OPS from .567 to .654 to .688 to .758. While it’s difficult to predict big things, Odom has enough skills that might play well as a backup. For the moment, he might be third on the depth chart at catcher so keep him in mind. Optioned to Gwinnett: Lane Adams…In his most extended shot at sticking in the majors, Adams has done some things well. He’s been an option off the bench with five successful steals, has belted a pinch-hit homer and another pinch-hit double and can play all three outfield slots. The negative is that he’s only on-based .267 over 30 PA. To be fair, he’s received zero starts so nearly all of his action has come in late inning situations. The returns of Danny Santana and Sean Rodriguez, along with Atlanta’s insistence to stick with an eight-man bullpen cost Adams his job. Chances are he’ll be back again in the majors at some point this season. He’s slashed .269/.320/.473 in the minors this year with 18 EBH, including 7 homers, and 15 steals. Promoted from Mississippi: Enrique Burgos…In a brief return to Double-A, Burgos never appeared as he waited for a spot to open back up in Gwinnett. Burgos has been wonderful since his trade from the Diamondbacks’ organization with a 1.15 ERA over 15.2 ING. He has K’d 18 and walked eight as well. Burgos may not be a top relief prospect, but he’s done a good job opening some eyes in Gwinnett and might get a chance in the majors with the Braves looking to tinker with their pen to get better results. Demoted to Florida and Re-Promoted: Xavier Avery…This is the first of many weird moves that occurred last week in which several players were shuffled down to Florida and back up. A few guys came up from Florida and were quickly shifted out again. It must have been a logistical thing. I just wanted to point this out because you’ll see some funny transactions here. In pretty much every one of these moves, the player never appeared during his brief time demoted/promoted. In regards to Avery, he’s been a productive player for the Gwinnett Braves this season. He strikes out way too often (104 in 292 PA), but he’s also got on base at a big-time clip (.371) and showed good pop (.213 ISO). He’s also added 15 steals and if it wasn’t for Adams, he’d likely be next-in-line in case a bench spot for an outfielder opened up. Demoted to Florida and Re-Promoted: Caleb Dirks…For the first time in his career, Dirks is struggling. Over his last six appearances (sandwiched around a trip to the DL), Dirks has given up eight earned runs and three homers over 8.2 ING. He’s K’d 8 in that time frame. Dirks has been remarkably consistent and awesome during most of his four-year career since the Braves took him in the 15th round back in 2014. It’ll be interesting to see how he answers adversity for a change. Demoted to Florida and Re-Promoted: Evan Phillips…Evan Phillips was a bit of a surprising promotion at the end of May because he was carrying an 8.14 ERA at Mississippi. That was a product of a bad handful of games to open the year. In his final ten games, he had a 2.81 ERA with 18 Ks in 16 ING. Since joining Gwinnett, he’s continued to pitch fairly well, though he needs to clean up the walks (12 in 18 ING). Still, he’s getting a strikeout an inning and has a 3.00 ERA in his first taste of Triple-A ball. You’ll take that anytime. A 17th-round selection back in 2015, Phillips won’t turn 23 until this September. DL: Mauricio Cabrera…The Atlanta Braves’ bullpen struggles may have started this year with the inability to get Cabrera going. He was expected to take a prime role in the pen after 38.1 ING in the majors last year with six saves and a 2.82 ERA. Instead, he has been abysmal in Triple-A with nearly a walk-an-inning. His last six outings were especially bad as he walked ten in 5.2 innings. Cabrera had control issues in the minors before but seemed to find it a bit after getting to the majors. It’s just flat-out gone now. DL: Kyle Kubitza…It hasn’t been the best season for Mr. Kubitza with a .232/.321/.324 line over 66 games. To be fair, the former prospect has turned it on since June 1, slashing .284/.375/.402. That kind of slash is why many Braves fans thought Kubitza might be a possible piece that could help the Braves’ team in 2015 before he was traded to the Angels in the Ricardo Sanchez trade. No word on what sent Kubitza to the DL, but at this point, he’s filler at the infield and outfield corner positions. 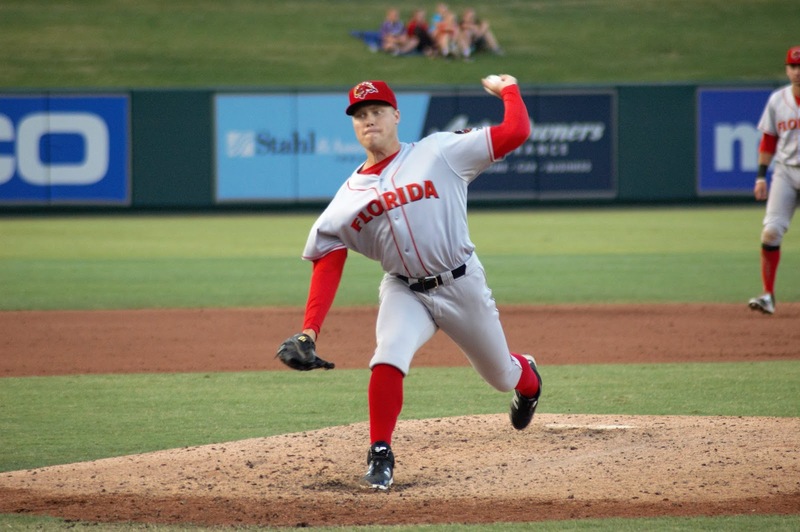 Promoted from Florida: Corbin Clouse…I didn’t put Clouse in my Top 50 Midseason list, but he was very close. He keeps this up, he’ll definitely be in it when we reconvene for an offseason list. Clouse has some ugly walk numbers this season in Florida, but something started to click for him over his final nine games. In 13.1 innings, he walked three and struck out 19 while not allowing a run. In the 21.2 innings before that, he walked 18 and struck out 27 with an ERA of 3.82. The change for Clouse warranted a promotion to Mississippi and he’s already tossed four scoreless innings there. When you add last year’s success between Danville and Rome, Clouse has a 1.69 ERA over his first 69.1 ING…which I hear is nice. He’s also struck out 103 of 287 batters, a rate of 36%. Not too shabby for a 27th rounder out of Davenport University. Promoted to Gwinnett from Florida and Demoted to Mississippi: Junior Rincon…Since joining the organization earlier this month, Rincon has spent most of his time in Florida but now returns to Mississippi where he threw one game out of the pen a few weeks ago. He also got a few days in Gwinnett but didn’t pitch. It would have been his Triple-A debut if he had. Promoted to Gwinnett and Demoted Back: Andres Santiago…Santiago gets around. 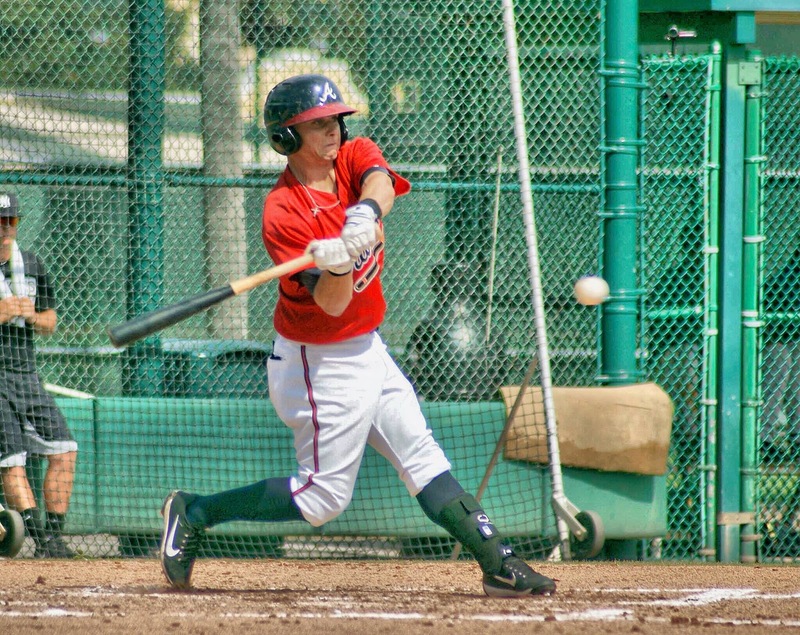 He’s played for four minor league teams this year and all of them are in the Braves’ system. Most of the season has been spent in Rome where he’s thrown 33.2 of his 53.2 innings. At 27, Santiago is an eleven-year veteran who is just trying to keep a dream alive. Promoted from GCL: Troy Conyers…A 23rd-round southpaw out of the University of San Diego, Conyers is a big guy at 6’5″ and 230 lbs. Slowed in college by Tommy John surgery in 2014, Conyers was switched from starter-to-closer in 2017 and it came together for him in a big way (12.5 K/9, 2.5 BB.9, 1 HR allowed in 46.2 ING). At 23, it was a surprise to see him in the GCL until you remember that the Braves drafted 20,000 left-handers in June and they couldn’t all be in Danville. Over eight games in the GCL, Conyers was absolutely dominant. In 14 innings, he struck out 19, walked two, and the only run to score off him was unearned. He needs a challenge and it might as well come in Rome. Demoted from Danville: Jeremy Fernandez…Fernandez wasn’t getting a lot of playing time in Danville and what playing time he did get resulted in a .174/.240/.196 line over 50 PA. This is the third season of his career and the 20-year-old has yet to show much offensive capability. He’s played mostly second base. Placed on Military Leave: Adam Groesbeck…The Braves knew this was coming. Groesbeck was a 38th rounder last month out of the Air Force Academy. After graduating, Groesbeck had 60 days of leave and a majority of that was spent with the Braves’ organization. The outfielder played in 14 games before leaving the team and struggled mightily with just two hits in 39 PA. He walked seven times and struck out eleven. Groesbeck was among the top hitters in Division I baseball last year with a .410/.460/.649 line over 50 games. According to new requirements put in place last April, Groesbeck must serve two years of active duty before requesting Ready Reserve status (which would last five years). As such, Groesbeck exchanges his baseball uniform for a military one and will begin his primary career as a drone pilot.